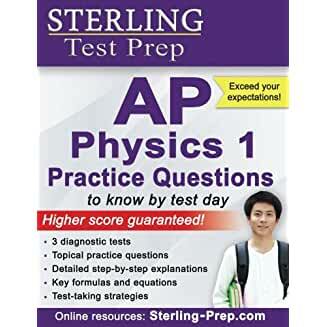 Speaking as a high school AP Physics teacher, this book serves as a supremely useful tool in helping me prepare my students for the AP exam. Not only does it include two high-quality, full-length practice tests, complete with comprehensive explanations, but each chapter of the book includes about a dozen high-quality, AP-style multiple-choice questions AND three or four superb free-response questions. Personally, I'm not that interested in the tutorial sections of the book as any algebra-based college-level textbook is sufficient for reading material and worked examples. That said, the reading sections here are high-quality and concise and can serve as a good quick review for students. This was purchased for my daughter. She found the books to be very useful in her studies. Came like promised! Exams are similar to the actual exam, made practicing a lot smoother. Will be using this for college courses maybe even! This book is excellent! There are numerous helpful practice questions and explanations. The book explains concepts in clear and consise methods. The book is written with humor and can be entertaining to read! Another thing I like about AP Physics 1 Essentials is that it has helped me understand the concepts, not just how to memorize definitions, equations, and processes. The material in this book is very similar to the material in my textbook and many of the practice questions are very similar to AP questions. Some practice questions are straightfoward and probably wouldn't appear on the AP exam, but they allow me to check my understanding on key concepts. Some of the harder questions are like AP questions. All in all, this book has greatly helped me in my AP Physics 1 class and I highly recommend this book! The book is very clear and concise. It's a great help a to my daughter in her physics studying. This book saved my son's life in AP Physics 1! Given that this AP exam was new at the time, there weren't a lot of study guides available to prep students. Although this book does not go in depth, it does lay the foundation of understanding to build on. Even his high school teacher did not have any real material to go by - not even an updated classroom textbook. Hiring expensive tutoring service was out of the question. I recommend that students study this guide in the summer before taking the class. Happy to say that this book, coupled with the Sterling Test Prep AP Physics 1 Practice Questions, and strong test-taking strategies paid off. My son passed the AP exam! This was my bible when I took AP Physics in high school. The tests in the book were definitely harder than the actual test, but that is what makes it so great. It prepares you for something harder, so that the actual test is even EASIER. I got a 5 on the AP test and this was the main thing I studied from! This book has very good example multiple choice problems, that cover each topic of the AP Physics 1 Exam. These multiple choice questions, accurately reflect the questions on the AP, however the free response questions only sometimes reflect what is on the exam, and other times are too difficult. 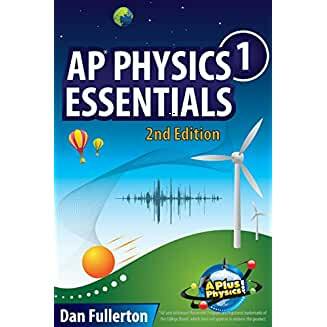 I found that this book also was extremely confusing in distinguishing AP Physics 1 and AP Physics 2 material from each other, often making me study material that would not even be on the exam. I recommend that this book be used for its excellent multiple choice questions, and some of its free response questions, but not so much for the written lessons, since they are often oversimplified. 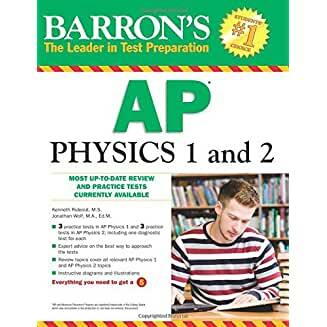 I found that the AP Physics 1 Crash Course Book + Online (Advanced Placement (AP) Crash Course), was far more helpful than the Barron's lessons. Also, the 4 practice exams for AP Physics 1 are all excellent and I recommend that you take them. When it's time (early April) to start working through full-length practice tests, this is a nice place to start. In honesty, I do get the feeling that this is largely a re-hashing of the A.P. Physics B (the very definition of an "inch deep and mile wide" curriculum) prep materials. That's not necessarily a terrible thing, though, if this is going to be the first full-length exam that you or your students work through. Some of the questions on the practice exams are very basic and very easy...like they HAD to be back when A.P. Physics B classes had to cover around 25 college textbook chapters in only 32 weeks prior to the exam. I'd be (pleasantly) surprised to see some of those very easy questions make it to the first A.P. Physics 1 exam...but it's still valid practice that touches upon relevant, testable content. I have almost 15 years experience as a high school teacher in physics. I have seen several changes in the standardized tests over the years. Students and their parents ask me for suggestions on how best to prepare for the AP physics 1 exam. Each year I visit the bookstore and review several books and recommend one or two books to the students for supplemental practice. This year I am recommending this book exclusively because I think it is much better than the alternatives. While no book is perfect, this is great. I like using this book for class and to prep for the AP exam. My understanding and scores have improved. Great coverage of the AP physics topics divided into chapters of practice questions. Several of my private tutoring students starting using this book so I decided to purchase a copy and evaluate the materials in great detail. 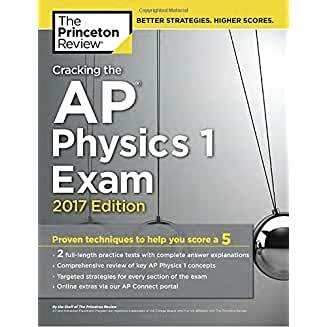 I have about a dozen years experience as a physics tutor so I am familiar with several prep books for the AP physics 1 exam. Content is the same as listed by college board, this is a definite plus since all topics are covered. I like the content of the Sterling physics books and the accompanying explanations. I have started assigning practice questions from the book and see my students are using the book to improve their understanding and performance on solving problems. This is a nice feeling when students improve in physics. I have suggested this book to several parents as the primary resource for physics prep (both for class and the AP).